Announcment: "In 1992 the "Conservation SIG" became the ESRI Conservation Program and was adopted as a formal ESRI program. 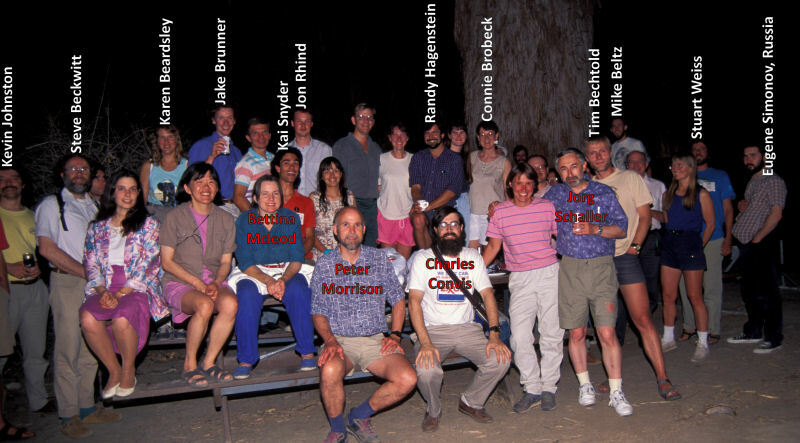 The program had grown to over 60 organizations by this time, with a dozen beginning to have significant effect, such as Steve and Eric Beckwitt's presentation of Ancient Forest GIS maps to congress that year, and the first joint ESRI-Hewlett Packard computer grant to the Hoopa Tribe. At the 1992 ESRI Conference, the conservation track grew to 40 papers and close to 100 participants, and included the first Native American sessions in reflection of the first ECP tribal grants that year. The first ever Conservation Booth, based on ESRI's presentations at the Rio Earth Summit that year, was set up and run by Charles Convis and Shaw Thacher, and the Aqua Cliente Birdsinger welcoming ceremony attracted nearly 300 conference participants interested in the program. The James Reserve saw almost 20 residents and nearly 40 showed up for the Wednesday night "Conservation Potluck". "I am happy to report that the Conservation Program continues to be well supported by ESRI, and is in it's second year now. I have worked on over 50 GIS donations so far, and HP is becoming more and more interested along with Sun in helping out with workstation donations. Shaw Thacher and I are also talking with Dell about their interests in possible PC donations. Folks here at ESRI are also looking into an idea that may someday help some of you with travel. Like many businesses, ESRI employees accumulate frequent-flyer miles during business travel, and we think it might be possible to have excess miles donated to others to help send people here for scholarship training, or send conservation volunteers abroad to do on-site training. This is just an idea right now but one I would encourage all of you to pursue with any of your local supporters who do a lot of business travel or local airlines." "I am pleased to see how many of the groups who started in GIS with donations last year are really coming into their own, building an impressive track record of accomplishments. Some of you are conducting briefings for congress and local officials using your GIS, others have gained enough expertise that you have begun reaching out to teach other conservation groups in your area. Many local battles have been joined and some even won, but we all have so much still ahead of us. It is more important than ever to stand by each other and look for ways that we can support each other's efforts. I think that GIS, where appropriately applied, is a very powerful tool that can help us fight on more equal terms with the various forces bent on demolishing our home planet. I share Thomas Jefferson's skepticism about the ability of governments or large institutions to do anything effective, in our case about population control, deforestation, biodiversity loss, global warming, etc. etc. etc. I assume that real change comes from individual citizens who decide to do something about the big problems they face, and who join together and empower themselves so those big problems don't seem so big any more." "As many of you begin to collect information about your local environments and resources and build your GIS databases, you will eventually start to ask questions of your data, trying to get at the truth of what is going on in your ecosystems and what really needs to be done. I am concerned that there is not enough theoretical guidance for us in how to analyze environmental data to produce verifiable and defendable recommendations. I think a lot of this guidance will come from the relatively new field of Conservation Biology, and I am happy to note that some of the major figures in this field, such as Paul Ehrlich, Michael Soule, and Dennis Murphy, are beginning to become involved in our Conservation Program. I would like to start a dialog about this issue at this year's ESRI User Conference, beginning with our informal welcoming lunch on Tuesday, June 9. Dr. Michael Hamilton has kindly offered us the use of the James Reserve again this year, for those of you who cannot afford hotels in Palm Springs and don't mind the 40 minutes drive. I need to know as soon as possible who is counting on staying at the reserve and when you wish to arrive and leave so I can get a count to Dr. Hamilton. I am faxing maps of how to get to the reserve as well as to my house in Redlands, which you can use as a staging area on your way to the reserve to pick up any maps you have missed or last-minute messages on Saturday or Sunday. We are also trying to organize car-pooling like last year, to accomodate people who can't afford car rentals. If you are renting a car and will have space, please fax us to let us know when you will arrive, which airport (LAX or ONTARIO), and how long you'd be willing to hang around waiting for a passenger. If you need a ride or a pickup, let us know. If there are a few people coming in at the same time we might be able to send a car to pick you up or we will coordinate you with someone else. " TUES LUNCH MEETING 12-1: Informal Welcoming Session to meet Dr. Ehrlich and each other, Aguas Calientes Birdsinger Dancers. Paper 222 Title: The Roles of GIS in Conservation. Paper 213 Title: GIS: A Worldwide Problem. Organization: World Wildlife Fund, U.S.
TUE EVENING 5-8: Demo setup for Wed.
Paper # Title: Advanced Methodologies for Biodiversity Reserve Design Using Remote Sensing and Community-based data with Arc/INFO, GRID, GPS and ERDAS. Application Spotlight # Title: Demonstration of Multimedia Applications of ARCVIEW and ARC/INFO. Paper 164 Title: Mapping Endangered Ecosystems and Species Using Raster and Vector Integration. Paper 280 Title: Integrated Resource Management Planning; How Arc/INFO was used in it's Development. Paper 171 Title: Application of GIS in Conservation and Development in Pikin Guerrero, Nicaragua. Paper 180 Title: Design of a Spatial Data Management System for Ecological Research Sites. Name: Dr. Steve Lansing Role: Chair Anthro Dept.